What does mobile washing have to do with the environment? Wash water—of any kind—must not be allowed to enter some drains. Storm drains and sewer drains are NOT the same. Sanitary sewer system – handles all waste water generated from sinks, toilets, showers etc. Storm water system – constructed to handle waste water generated from weather only. The main difference between the two distinct systems is that sewer water is treated and cleaned, and storm water is not. Herein lies the problem. When washing is done in a parking lot or any outside area, the runoff, if not contained, enters the storm system and therefore is discharged to a body of water, ponding basin, etc., without being treated or cleaned at all. Because of this issue, authorities have passed laws governing washing activities. Mobile washing and water runoff is governed by a variety of agencies, depending upon your location. The Environmental Protection Agency, (EPA), a federal agency, is the originator of all such regulations. In 1987, The Clean Water Act began requiring that the EPA to issue storm water discharge permits to be administered by each state. In California, the State Water Resources Control Board elected to adopt a permit covering the whole of California. Every entity, either public or private, is covered under this general permit and compliance is required. Eliminate non-rain discharges to the storm system that may occur as a result of activities such as truck washing, the cleaning of forklifts, containers, loading docks, etc. Seek to eliminate pollutants, (chemicals, spoiled product, and other substances) that may be exposed to rain water and washed down the storm system. All wash water from the washing of trucks and other equipment must be diverted from storm drains, recovered, and disposed of into the sanitary sewer system. Areas used for the washing of such equipment must be washed clean. Wash area water must then be diverted and recovered. Valley Fleet Clean has been at the forefront of addressing the need for environmentally safe and legal mobile washing since these laws were enacted. Site Plan—Before any washing begins, we will visit and physically inspect the wash site, noting water flow characteristics, storm water entry points and legal disposal areas (if any). 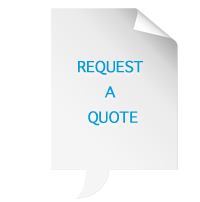 Upon completion of this inspection, you will receive and have an opportunity to review a written site recovery plan specifying the exact methods and procedures to be implemented. Diversion, or drain protection—This can be accomplished in a number of different ways, depending upon the type and number of wash area water entry points. We have numerous types and styles of drain plugs and artificial damming mechanisms. 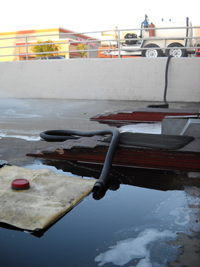 Collection—This is achieved by “vacuuming” pooled water into one of our collection trailers. 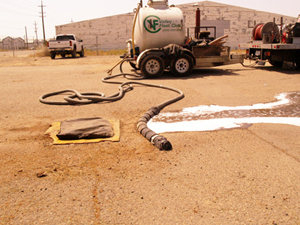 Our collection equipment does NOT consist of simple “shop vacs” like many mobile wash operators, but rather a custom-designed gasoline-driven vacuum system similar to those used by most septic haulers. This system has the capacity to remove large amounts of liquids quickly and efficiently. Disposal—This can be legally be done in two ways: On-site sanitary sewer disposal or transport to a Valley Fleet Clean site for permitted discharge. It is important to note that when the correct chemicals and processes are used with recovered wash water, it is well within legal limits for unprocessed disposal to a sanitary sewer.